How do I register PEAKS Studio? Activate PEAKS with a trial or purchased license key: Pick this option if you have a license key. Enter the key in the “Enter License key” pop up and PEAKS will restart. Register to get a free trial license key: Pick this option if you would like to get a free 15 day trial license key. Use PEAKS as a viewer: Pick this option to strictly view PEAKS projects only. I am following the registration procedure but I am unable to complete it. Click on the “Activate PEAKS Manually” button in the bottom right hand corner of the licensing wiard. Enter the requested information. Click next. If you are registering a demo on a computer, you can use the process described in the “how do I register PEAKS Studio?”” question above to get a demo license key. Save the license request file and transfer it to a computer with an internet connection. Follow the instructions on this page to request a license key. You will receive a licnese key in your email inbox. Transfer this key over to the computer you would like to install PEAKS on and paste it into the text box provided in the “important license” step of the wizard. Click next, once you proceed through the licensing wizard, PEAKS should restart and be fully functional. What are the recommended/maxmimum performance configurations for PEAKS? On this page, you will find the recommended configurations for PEAKS Studio and PEAKS Online, desktop/server solutions respectively, as well as ideal configurations. Can PEAKS read my raw data from (Thermo, Sciex, Waters, Agilent)? PEAKS can. Please check our data types section for how to load data from your instrument. How do I connect to the Mascot server through PEAKS for inChorus? In Preferences, go to “Search Engine”, then “Mascot Settings”. You will need to know the IP address or name of the Mascot server and Mascot version. Enter this in the ‘Hostname (or IP address):’ text box. Often this is simply “//mascotserver” without quotes. Enter the ‘Port:’ number, the default is 80. Enter the virtual directory, the default is ‘/mascot’. Select your version number in the ‘Version’ drop down menu. If you need to use a user name and password to login, you can enter them in the sections below the version number. Check the “Save Password” box so you do not have to enter it every time. Click the “Apply” button to save any changes you have made. How do I import Sequest results for PEAKS inChorus? Export a pepXML result report from Sequest. When setting up an inChorus search, select the Sequest drop down > Import. Select the database you used in the Sequest search. Be sure that you have the same database configured in PEAKS. Use the browse button to find the exported pepXML file. Click ‘OK’ to include the Sequest result in the inChorus run. Can PEAKS run two fragment types, for example, CID and ETD? The answer is yes. When you are loading data with mixed fragmentation types, select ‘Mixed CID/HCD/ETD’. PEAKS will automatically detect the fragmentation type of each scan based on the data given. I want to import Thermo/Agilent/Waters data into PEAKS. What do I do? If you are using PEAKS for the first time, visit our page dedicated to supported data file formats. This will address 99% of users. Thermo Raw Files: In order to make reading Thermo raw file work in PEAKS, users must first uninstall the 32 bit version of Thermo MSFileReader that worked with PEAKS 6 or earlier versions. Then install the 64 bit version of Thermo MSFileReader either separately or from configure wizard in PEAKS. Agilent Raw Files: In order to make reading Agilent raw file work in PEAKS, the user must first uninstall the 32 bit version of Agilent MassHunter Data Access Component (MHDAC). Then install the 64 bit version either separately or run RegisterMassHunterDataAccess.bat under C:\PEAKSStudio#\MHDAC_x64 directory in Administrator privilege. Waters Raw Files: PEAKS supports the direct reading of Waters raw files provided Masslynx is configured. PEAKS will not load past the starting screen. How do I resolve this? My data is stuck loading at 0%. What do I do? What do the TLC and ALC scores in my de novo results mean? Local Confidence is the confidence that a particular amino acid is present in the de novo peptide at a particular position. It is presented as a percentage. Total Local Confidence (TLC) is the sum of the local confidence scores (0 to 1) from each amino acid in the peptide sequence. Average Local Confidence (ALC) is the average of the TLC. It is TLC divided by the number of amino acids in the peptide sequence. What is the cut off for a good de novo result? Usually you will find good peptides at 55% and above. This does not mean that the whole sequence is the correct sequence. This is because the beginning and end of the spectrum are much more difficult to interpret when it comes to de novo sequencing due to the high mass/low mass of the ions produced by these fragments. This is why we added the colour coding to the results so you can see where in the sequence there is higher confidence. How to remove low scoring amino acids from the ends of de novo sequence tags before exporting? You can definitely chop off the low scoring amino acids from the ends of the de novo sequence tags. To do this, click on the score threshold slider button (green, yellow, red symbol at the top of the de novo results). 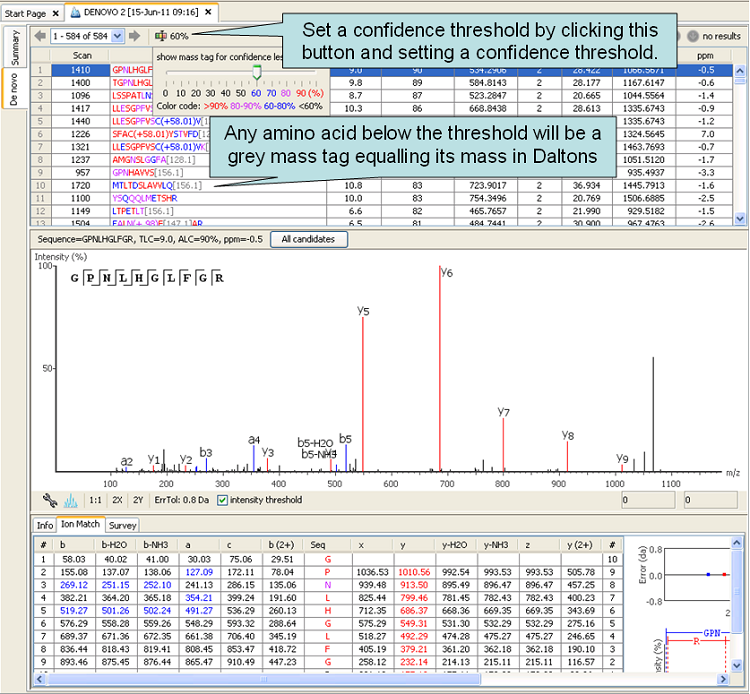 Use the slider to set a score threshold and any amino acid below that threshold will be reduced to its mass in Daltons. Once you export the tags, the last column in the excel export will follow this confidence threshold. What are the differences between PEAKS and other de novo sequencing programs? Bottom line: result quality. PEAKS consistently gives more accurate peptide sequences and with better confidence than other programs. This is a result of PEAKS’ global optimization algorithms and sophisticated scoring schema. What is the meaning of the -10lgP Score? The -10lgP score is simply a p-value on an increasing scale. For example, a p-value of 1% equals a -10lgP of 20. For a given score x, its equivalent P-value is the probability that a false identification has a score greater than or equal to x. For more information on the scoring system see the following PEAKS DB Score Tutorial. How should I format the database protein header to use a custom database? PEAKS only requires the database to be in FASTA format, and the header should contain only standard ASCII characters. In PEAKS DB, I receive no results, what happened? Likely the database was simply not located by PEAKS. In PEAKS, go to Configuration then Database. Make sure you have the correct FASTA database type selected in the drop down menu and the correct database path selected in the path text box. How does PEAKS handle PTMS with a neutral loss mass? For PTMs with a neutral loss mass, PEAKS will search for both the monoisotopic mass of the modified amino acid as well as the neutral loss mass. PEAKS does not require the neutral loss mass to be there in order for the modified amino acid to be identified. It does help if it is present. What constitutes a good SPIDER match? Please refer to PEAKS DB Score Tutorial for more details. How do I configure Mascot & Sequest Search Engines? Using Mascot as an example, in Preferences, go to “Search Engine”, then “Mascot Settings”. What do the inChorus percent scores mean? The peptide percent score reflects the quality of the peptide-spectrum match taking into account all search engines used. The score is calculated in accordance with the empirical calculation used in Peptide-Prophet. The protein percent score is calculated from the peptide percent scores. The peptide percent scores are combined by a weighted sum for each protein. The PeptideProphet method is then applied to the whole set of proteins to get the final protein probability scores. What does ″-1″ mean in my iTRAQ/SILAC results? “-1” means that a ratio was found but it was not derived from any high scoring peptides. If you want the ratio to be displayed, you can raise the peptide score threshold set in the run parameters. Why can′t I perform label free quantification? The most likely reason is users must have at least two samples and the same number of fractions in each sample. For questions pertaining to other products and services, please contact support.